Global Child Forum participated at the CSR Asia Summit bringing a child rights perspective to one of the most important annual events for sustainability leaders in Asia. The event is recognized as the platform in Asia where business, government and civil society come together to network and build relationships, aiming to find solutions to today’s increasingly complex sustainability challenges. This years event took place at the Amari Watergate Bangkok on 26 & 27 September. The theme for this year – future proofing sustainable business – explored how organisations are recognizing that there are measurable benefits associated with having a sound sustainability strategy. To leverage this strategy organizations need to move from being reactive to proactive. Global Child Forum led a session on Children’s rights: the risks and opportunities for business. The session showcased ground-breaking research, good company examples and free on-line risk assessment and planning tools. Read more about the session and its take aways here. The corporate sector is increasingly acknowledging that children and their rights are part of their business operations and corporate responsibility. Asian companies that integrate a child rights perspective into their business are able to unlock more market opportunities and create shareholder value. While companies have the opportunity to positively impact the lives of children, there’s also a real risk to reputation and a company’s long-term sustainability in not taking children’s rights into account. What’s the business case for investing in children? When conducting business, how do we ensure that children’s rights are respected? What can companies do to integrate children’s rights into their operations? This session featured leading company examples, regional research conducted by Global Child Forum and the Boston Consulting Group, and showcases the The Children’s Rights and Business Atlas, developed by Global Child Forum and UNICEF. The audience also had the opportunity to ask questions to a panel of leading companies. This side event was a continuation of Global Child Forum’s work in the region, following up on the Global Child Forum on Southeast Asia in Kuala Lumpur, April 2016. More information and the full Forum Report can be found here. Tiur is RSPO‘s Indonesia Director of Operations. Prior to joining RSPO, she served as the Executive Director of Indonesia Business Council for Sustainable Development (IBCSD). Tiur has a background in Finance, and has been working in various international cooperation and projects since 2003. With more than 6 years experiences in leading Indonesia Sub-Regional Economic Cooperation, Tiur also currently serves as one of Indonesia Country Director for the Brunei-Indonesia-Malaysia-the Philippine East Asian Growth Area (BIMP-EAGA). In the high-level corporate panel and moderated discussion, Tiur presented the example of how RSPO has worked to combat child labour through industry coordination. Ms. On-uma Rerkpattanapipat is dtac‘s Senior Vice President of the Communication and Sustainability Division, the third largest mobile provider in Thailand. As part of her work at dtac, Ms. On-uma and her team have pioneered dtac Safe Internet program in partnership with UNICEF and piloted tools for child protection in the ICT industry, among other activities. Prior to her position at dtac, she gained vast experience in communications and marketing working for other large companies from the private sector including IBM and BMW. Ms. On-uma Rerkpattanapipat holds a MBA degree from the Sasin Graduate Institute of Business Administration and a bachelor’s degree in politic science from Chulalongkorn University. Christophe heads Talent & Culture for AccorHotels within nine countries including Thailand, Vietnam, Cambodia, Laos, Myanmar, the Philippines, Japan, South Korea and the Maldives. He is actively involved in corporate social responsibility and values the importance of community engagement. Within the hospitality industry for more than twenty years, Christophe is encouraging hotels to roll out WATCH (We Act Together For Children) under AccorHotels Planet 21 sustainable programme by establishing partnerships with ECPAT, The Code, ILO and United Nations. At a regional level, he also leads the AccorHotels Diversity & Inclusion committee and aims to drive the change towards positive hospitality. Christophe holds a Bachelor Degree in Economics and a post Graduate Degree in Hotel Management from France. Based in Bangkok, Christophe spends most of his time traveling around the region enjoying the richness of cultures and diversity of people. Ms. Kaempfer has worked in the field of CSR supply chain management and children’s rights for over a decade, with a strong emphasis on China’s manufacturing industry. As the Executive Director of CCR CSR, a leading child rights consultancy based in Hong Kong and Beijing, she heads the design and implementations of operations and stakeholder engagement. She has previously held positions at ELEVATE Limited and the Fair Labour Association in Geneva and Shanghai. Ines moderated the high-level corporate panel and discussion. As Research Director, Fiona is responsible for directing, producing, and showcasing our research studies and tools, as well as our research partnerships. Fiona has worked in both the private and public sectors during the past 25 years, including as a consultant for Arthur D. Little, assistant professor in Political Science at Uppsala University and acting Executive Director at the Dag Hammarskjöld Foundation. Fiona holds an undergraduate degree from Oberlin College, a Master’s Degree from Tufts University, and a Ph.D. with distinction in International Law and Natural Resources from Tufts and Harvard Universities. Fiona joined Global Child Forum in 2015. Fiona hosted this session, and presented some of Global Child Forum’s research on the Corporate Sector and Children’s Rights in the region. Martin Hallberg is a corporate sustainability expert with a proven track-record as consultant in various industries such as private equity, telecom and construction. Further to his consulting experience, in his role as Children’s Rights and Business Atlas Manager with the Global Child Forum, Martin also draws on his global development experience from the Swedish Ministry of Foreign Affairs, International IDEA and the UN system when working to spread the Atlas throughout the business community. Martin holds a MSc in Political Science from Uppsala University and SciencesPo Paris. He is a published researcher within the fields of social capital and regional entrepreneurship and is an appreciated lecturer within corporate sustainability. Martin is a strong believer in communication, dialogue and transparency as key drivers to unleashing businesses’ deeper purpose. Martin manages the development and roll-out of the Children’s Rights and Business Atlas at Global Child Forum and presented this tool in the session. Introduce the objective of the session, the speakers and the agenda. Frame the discussion through references to Global Child Forum and Boston Consulting Group benchmark study “Children’s Rights and Corporate Sector in Southeast Asia” and some regional Children’s Rights and Business Atlas risk profile. 2. Why children’s rights and business? Making the case for why business needs to address children’s rights; showcase good practice/methods and some available tools to get started on the journey. What is the Children’s Rights and Business Atlas and what value does it bring to business? How can it be used? Why is child protection important? How to make it part of day-to-day business? What is the business case? 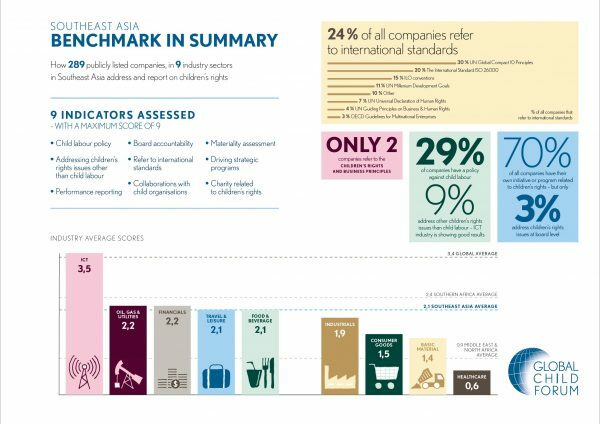 For the Global Child Forum on Southeast Asia in 2016, Global Child Forum and the Boston Consulting Group conducted a benchmark study on how children’s rights are addressed by the corporate sector in the region. This benchmark study investigated the 289 largest publicly traded companies in Southeast Asia (based on revenue for 2014). Without measuring actual performance or compliance, the study aims to highlight if and how these companies address and report on children’s rights by reviewing and assessing publicly available information against nine indicators. The 289 companies selected represented nine different industry sectors that are exposed to or whose operations impact children’s rights issues. The purpose of the benchmark studies is to to analyse trends on a global and regional scale and to enable tracking of progress on how the corporate sector addresses children’s rights over time.